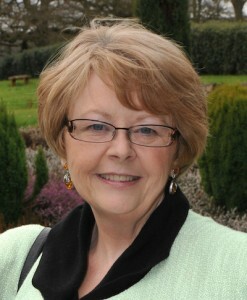 I was born in Liverpool, and trained as a medical secretary, subsequently working for the UK’s National Health Service. I spent twenty years living on a croft in the Highlands of Scotland, managing a company involved in the offshore oil and gas industry. During those rare times when I am not working on my next novel, I can be found curled up with a book, gardening, designing knitwear, walking my somewhat delinquent Border collie, Rosie, or travelling the world. I’ve always enjoyed writing, although I think my English teacher might be surprised by that statement! As I child I found the task of writing essays on a given subject boring, and it was only when I started writing to friends, sharing travel adventures with them that the idea of writing a novel came about. In May 2000, I travelled to Seattle and that’s where I got the idea for my first novel, Three Weeks Last Spring. How strange that you should ask this questions as I gave a talk recently on the very subject! I certainly hear voices in my head and act out complex scenes, and I know I’m not alone in this. J K Rowling once said that a boy with black hair and glasses popped into her head one day and said something along the lines of “Hi, I’m Harry Potter.” In my case, it’s usually a piece of dialogue that triggers the idea for a conversation between my two protagonists. Learn your trade. Read everything you can about creative writing, and how to format a manuscript. Never submit a manuscript until you are sure it is as near perfect as it can be. Check your manuscript to ensure your time line is correct, that Ann on one page doesn’t become Anna on page two! Spell check was invented for a reason, so use it. Edit, not once, not twice, but as many times as it takes to refine your work into a well-honed story that will have the reader waiting for the next twist in the plot. You’d be surprised how easy it is, during the course of a long manuscript, to make simple errors that could mean the difference between rejection and acceptance. And talking of rejection and acceptance – remember it’s nothing personal. Publishing houses on average, receive upwards of three hundred manuscripts a day, so a good query letter and synopsis is essential. And lastly, never give up! My books were originally traditionally published, but the rights were later returned to me. I subsequently self-published all three books. I am undecided as to which route to take with my current manuscript. This is a difficult question to answer and I wish I had a crystal ball! Self-publishing is here to stay and is a valid option for all writers. Those writers with an established career will continue to be traditionally published; I’m thinking of such people as J K Rowling, Lee Child, Nora Roberts, Ian Rankin etc. Ebook sales will continue to grow, but I don’t foresee the death of the print book just yet.